Did anyone else grow up on tuna melts? Or tuna ‘bakes’ if you were in my family, which involved an English muffin base, simple tuna salad made with mayo, green onion and maybe fresh herbs, topped with a slice of orange cheddar and baked in the oven (or possibly the toaster oven). For my sisters and me, this was way up there on the list of awesome, comforting lunches. 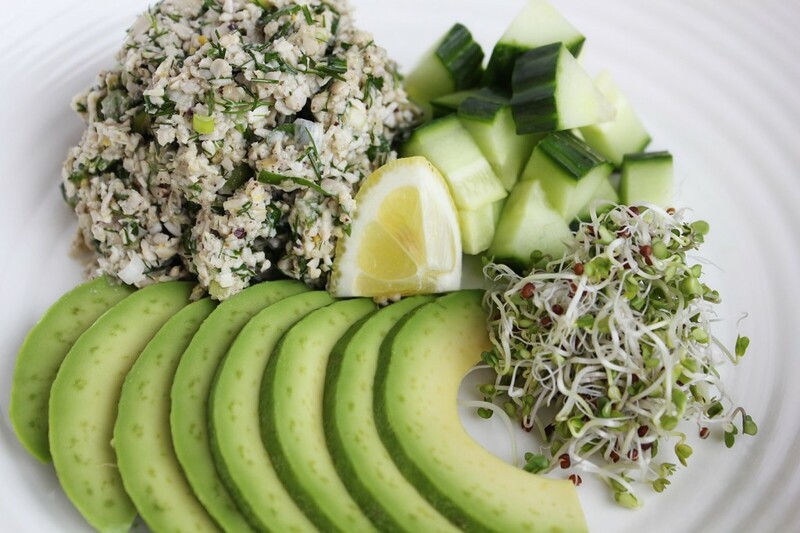 Dairy and wheat are usually the first things to exit the diet once we start to learn about our health, and shortly after that tuna, either for its mercury content or maybe because you are trying a plant-based diet. Bizarrely enough, tuna is the easiest of the three components of a tuna melt to re-create in a healthy and convincing way. I promise you, tuna-free tuna salad is not as weird as it sounds. 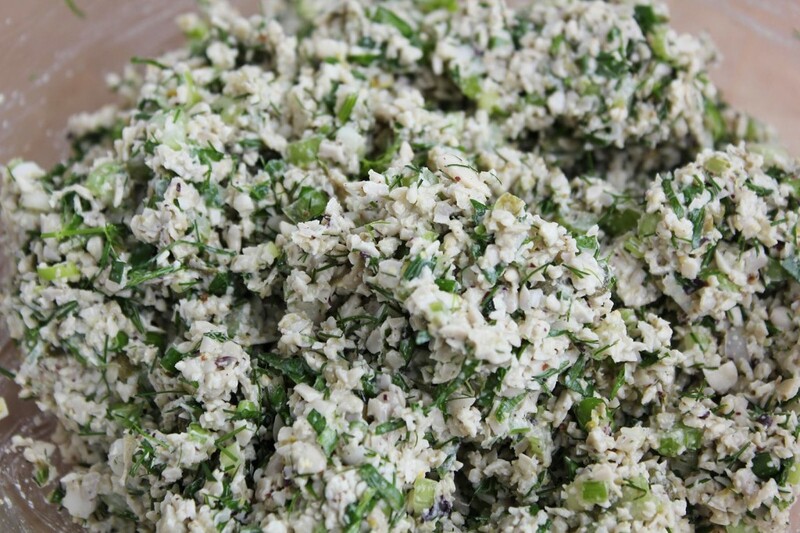 It certainly looks like tuna salad, which is ¼ of the battle (maybe ¾ if I’m trying to convince you through pictures), but it really does taste like it too, thanks to some ingredients that are often served with fish dishes and therefore remind us of fish while we’re eating them. Does that make sense? 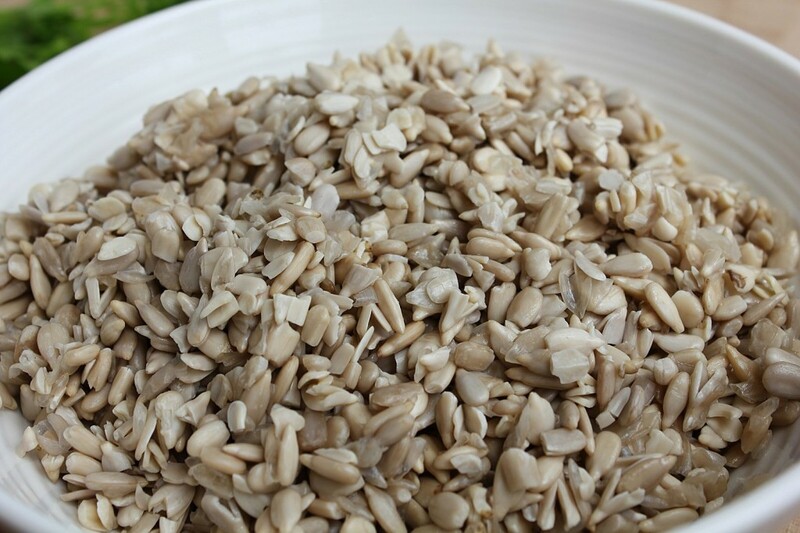 Sunflower seeds as the base, once soaked give the appearance of flaked tuna (not to mention that the soaking process activates the enzymes, bringing them to life and making them easier to digest). They are bland enough to take on the other flavours, which is a good thing in this recipe. Dulse, a type of sea vegetable (seaweed) is super helpful in the world of faux seafood. It tastes like the ocean, like clean, fresh fish, like surfing in Tofino. My Mother-in-law told me recently that she didn’t like it and couldn’t eat it as hard as she tried and wondered how I could enjoy it. Here’s the thing, I don’t eat it on it’s own (some do, but some people like kale juice straight-up too), it is intense and distinctly sea-like, but I don’t eat miso, mustard, chili peppers or soy sauce on their own either. Added in small amounts though, they all have punch that goes a long way. A bit of dulse included in recipes that would normally have an essence of seafood in them (fish sauce in Thai curry, anchovies in caesar dressing, or puttanesca sauce) can add back what we miss by removing the actual fish from the recipe. Also, it’s packed with minerals that support (among other areas of your body) your thyroid. 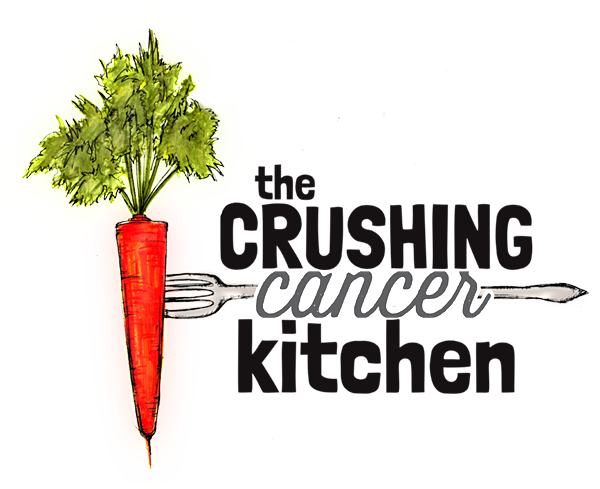 I can’t decide which is more exciting, the plant-based culinary opportunities it allows us, or the health benefits. I guess it doesn’t really matter because in the end everybody wins. Now for the other ingredients that are going to trick your palate into a retro tuna fish experience. Capers –you may not have ever added these to your tuna before, but they are found on smoked salmon platters and add a briny kick that will nudge your brain in a seafood direction (a great alternative would be homemade or store-bought naturally fermented pickles). 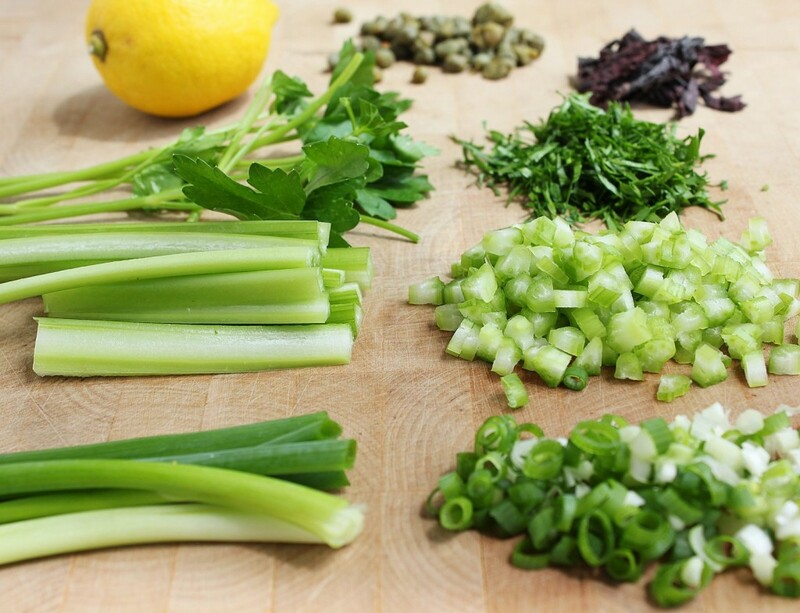 Dill, parsley, lemon, green onions, celery –besides adding the secret vegetable components to the dish and all of the phytonutrients they are packing, they are also ‘seafood’ style ingredients that you would see in tuna salad, or next to a filet of salmon. It really is straight up trickery. I like to add extra virgin olive oil, but if you prefer a creamier tuna salad, mash some avocado into it or some soaked and puréed cashews in place of traditional mayo. We have the tuna down, but what do we put it on now that bread is off the list? I’m glad you asked. My simplest answer is collard greens, the best bread replacement of all time. 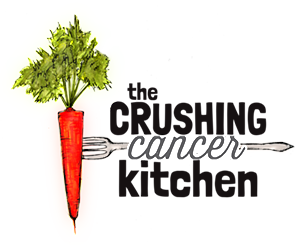 They are from the cruciferous family (famous cancer crushers), look like Brontosaurus food and are hearty enough to hold in just about anything and often keep in the fridge for a week at a time. Wrap up the tuna with some cucumbers, grated carrots, avocado slices, broccoli sprouts, hummus –literally whatever you’re feeling. 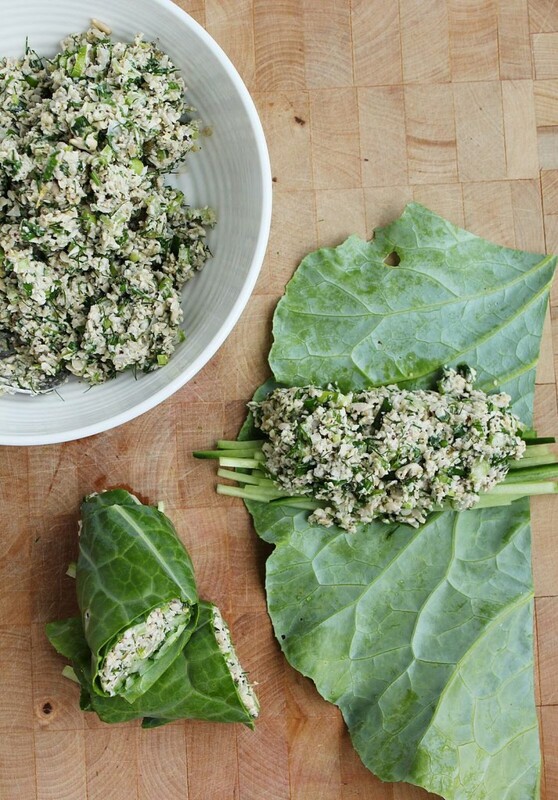 Alternatively, use a cabbage or lettuce leaf for a change of scene. 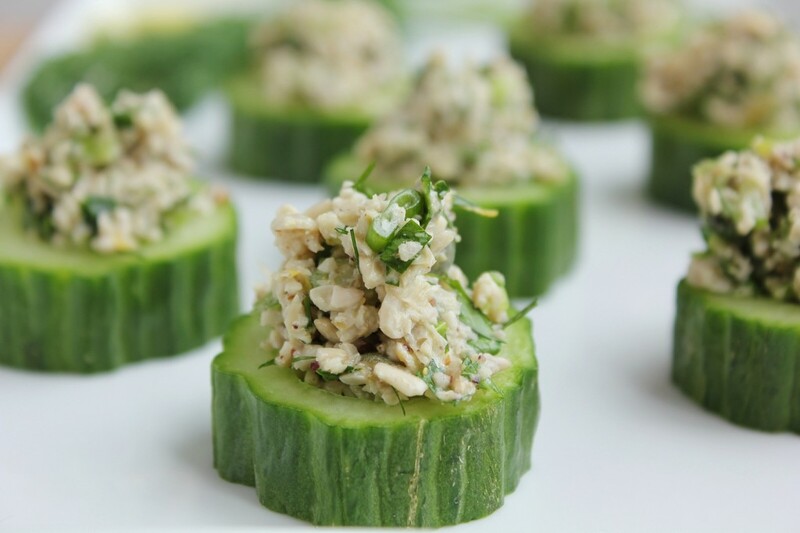 You can get fancy and make cucumber canapés (I use a teaspoon to scoop some of the seeds out to make room for more tuna), or arrange it in a dish with some other veggies the way you might have seen tuna salad served at the tennis club in the 80’s. When I first met my husband, he had a cupboard full of canned tuna, rice cakes and some milk in the fridge for his coffee and that was it. He doesn’t eat tuna anymore but he LOVES this stuff and he doesn’t shy away from giving an honest opinion about food. Go pull the raw sunflower seeds out of your freezer now and soak them so that you can make this tonight or tomorrow, it’s going to make you so happy. 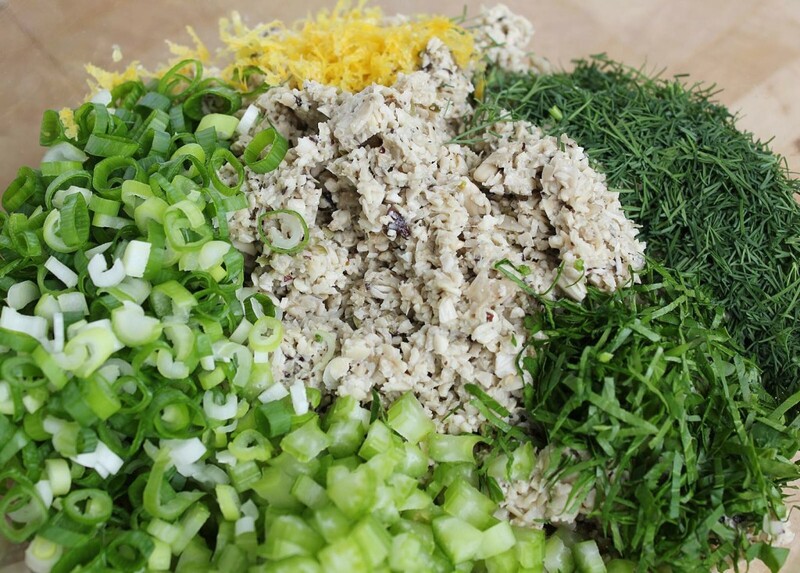 In a food processor, grind up the soaked sunflower seeds, mustard, capers, dulse, lemon juice, zest and olive oil, until the texture resembles tuna and it holds together a little better. 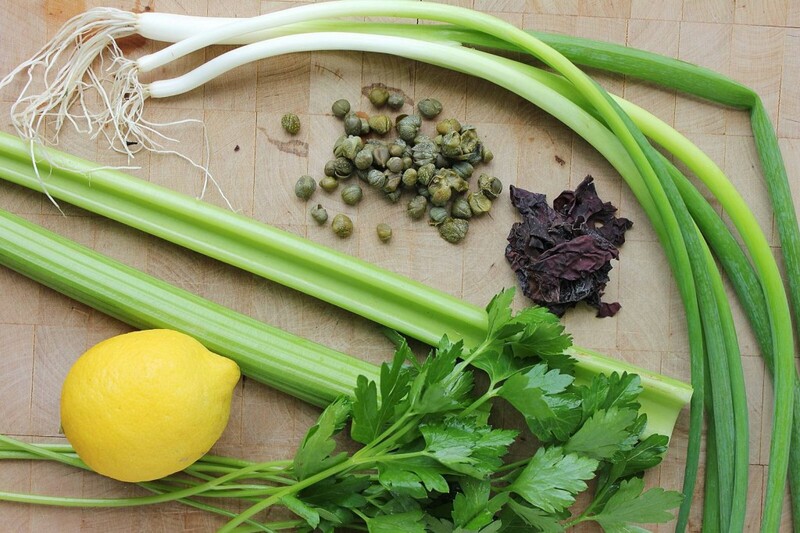 Transfer contents to a bowl and add the herbs, celery and green onions and stir together. Taste for seasoning, you probably won't need any because of the salty capers, but if you do add a little bit of sea(weed) salt. That's it! 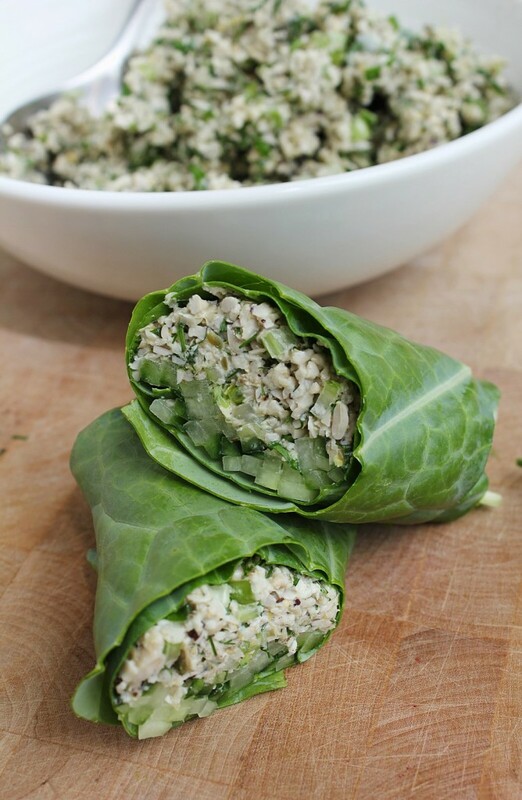 Now wrap it up in a collard with some avo slices and broccoli sprouts, mound on top of cucumber slices, stuff inside a tomato, put a big scoop on a plate with other salad-y things like avocado, tomato and sprouts, or simply serve as a dip for raw veggies.